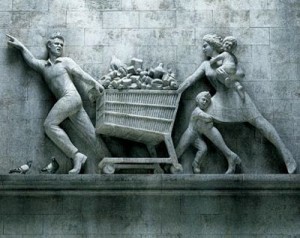 Supermarkets – Once the only Place to be for the Modern Hunter/Gatherer. Now just one of many options. Countdown CEO David Chambers announced yesterday that he is moving on in June. Not an earth shattering event as such. Senior business leaders are constantly on the move, right? Yes, indeed; but there are a few aspects to Chambers’ tenure at Countdown/Progressive that are worthy of consideration. In the first instance, CEOs these days can’t typically point to a thirty-nine year employment record in the business they are leading. In fact, in most businesses someone with such a length of service has no chance to be offered the top job. Secondly, Dave Chambers is likely to be the last participant of the original Foodtown Management training programme who ends up in the top job at Countdown. The early Foodtown supermarket training model of the sixties and seventies was innovative, demanding and future focused, preparing its participants very well for coping with the challenges of modern food retailing and all it entailed. “Modern” meant something different in those days though. When Chambers joined the training programme, stores were open five days a week, with a late night on Thursday. All store management positions were held by men, automatic replenishment systems were unheard of and computers were something Steve Jobs played around with in his garage. The Internet had yet to be invented, home shopping did not exist and all produce for Foodtown was purchased at the auctions. We can safely agree then that Dave Chambers has seen a few changes in his career and that is without discussing the various ownership changes at Progressive, the demise of the Foodtown brand in favour of the Woolworths logo/Countdown name, the 180+ stores the company operates today as opposed to the 20+ branches the company had when Dave became a store manager and the many changes he would have seen in his stores over the last 39 years. In those days, Foodtown stores did still have fully functioning butchery departments, with half beasts getting delivered to every store for processing each day. Today, stores are serviced via a centralised meat processing plant and the stores are void of butchers. A little known side benefit butchery departments provided their store managers with was instant security. When power cuts occurred, butchers were positioned at the checkouts, complete with meat cleavers and other suitable utensils to ensure that full supermarket trolleys did not start rolling out of the doors without their content having been paid for. Chambers’ produce managers in his early store manager appointments in Foodtowns Kelston, Grey Lynn and Greenlane, were skilled in completely stripping and rebuilding mirror back displays, long before refrigerated cases became the norm. As head of produce during some of those years, I was in and out of our stores on a regular basis and knew all our stores managers. Dave Chambers stood out from the crowd even then, as a skilled professional with an appetite for knowledge and learning, an engaging persona, a willingness for constructive dialogue to achieve conflict resolution, a passion for food retailing and well respected by his staff – something he did not take for granted. Dave, I wish you well in wherever your new journey takes you to.